Ever since our founding, we have aimed to be #1 with our customers. That idea has inspired our mission to provide prompt, accurate, and high-quality services to our clients in authentic native-sounding English. With supportive buy-in from our clients, we have cultivated long-standing relationships of trust from which we have built our service offering to assist as many clients as possible. 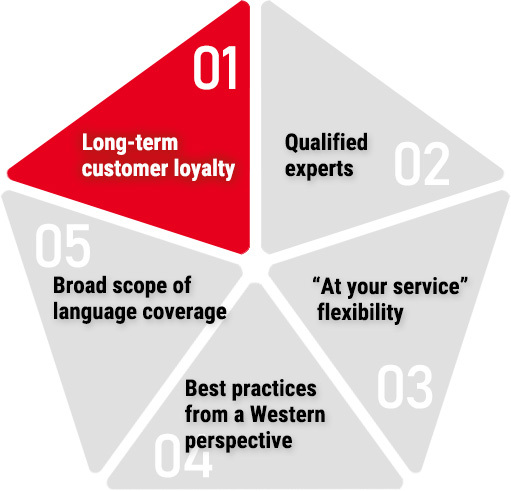 Our 700 translators, writers, and interpreters with practical US-Japan business experience deploy their native language skills to assist you in your process. Everything we do is with our clients’ needs and convenience in mind. We micro-manage the process to ensure it is optimally convenient for our clients. During the engagement, we utilize schedules and glossaries to make sure the process is carried out according to plan. At the time of delivery, we also send across detailed notes to ensure the translation is understood. We collaborate with our affiliates to take away the hassle and ensure top-quality. This is why we cover ancillary services, such as printing, digitization, and manuscripts. Our translator network covers over 40 languages. Please entrust us with your inbound translation requests to help you serve your foreign patrons.